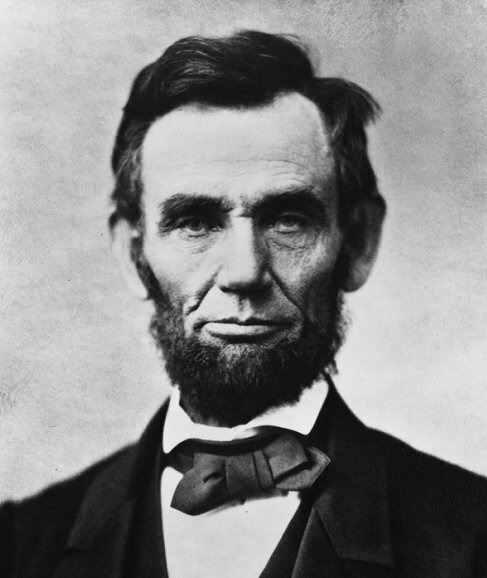 Abraham Lincoln was an American political leader during the 19th century. Rising from humble beginnings, Lincoln was elected as the 16th President of the United States in 1860. Lincoln's election prompted the secession of several Southern states and eventually the beginning of the American Civil War. Lincoln served as president and commander-in-chief throughout most of the conflict before an assassin's bullet tragically cut his life short on April 15, 1865. In March 1830, when Lincoln was a young man, his family relocated to a new farm in Illinois. Not wishing to become a farmer, Lincoln moved to New Salem, Illinois in July 1831.While living there, he engaged in several occupations, including ownership of a general store, which eventually led him into bankruptcy. In 1832, Lincoln served briefly as a captain in the Illinois militia during the Black Hawk War, but he never engaged in combat. During the same year, he ran unsuccessfully for a seat in the Illinois General Assembly. Following his loss, Lincoln served as New Salem’s postmaster and as a county surveyor. During that time, he also decided to become a lawyer and began studying the law independently. Still active in politics, voters elected Lincoln to serve in the Illinois General Assembly in 1834, and voters re-elected him in 1836. As a member of the Whig Party, Lincoln supported a free-soil position, opposing both slavery and abolitionism. Lincoln’s career in national politics began in 1842, when Illinois voters elected him to the United States House of Representatives. While serving in Washington, Lincoln introduced a plan to abolish slavery in the District of Columbia. Lincoln also voted to censure President Polk for usurpation of powers regarding the Mexican-American War in 1848–a vote that later seemed inconsistent with Lincoln’s own actions during the American Civil War. After completing his term in Congress and not winning reelection, Lincoln returned to Springfield to practice law in 1849. He was reelected to the Illinois General Assembly in 1854, but he declined to serve because he was pursuing election by the Illinois legislature to the United States Senate. His Senate bid was unsuccessful, but he returned to try again in 1858, running against incumbent Stephen A. Douglas, author of the Kansas-Nebraska Act. When Lincoln accepted the Republican nomination for the Senate seat at the state convention on June 16, 1858, he delivered his famous line that “a house divided against itself cannon stand.” Lincoln and Douglas engaged in a series of seven debates across Illinois during the late summer and fall of 1858. Although Douglas won the election in November, the debates, which focused primarily on the issue of slavery, enhanced Lincoln’s national reputation and bolstered his reputation among Republicans. On May 18, 1860, delegates to Republican National Convention held in Chicago, selected Lincoln as their party’s candidate for President of the United States In November, Lincoln received only 39.8% of the popular vote, but his 180 electoral votes were enough to defeat three other candidates, including Stephen Douglas, in a highly sectionalized election. The Southern response to Lincoln’s election was quick and electric. On December 20, 1860, delegates to a secession convention in South Carolina voted to secede from the Union because they viewed Lincoln’s hard-line stance against the expansion of slavery as a threat to their way of life. By the time Lincoln was inaugurated on March 4, 1861, six other states had left the United States of America. Despite attempts to resolve sectional differences–most notably the Crittenden Compromise–Lincoln faced a constitutional and military crisis the day that he took office. Events rapidly spiraled toward war when South Carolina demanded that Federal soldiers evacuate its military installation at Fort Sumter in Charleston Harbor. After weighing several options, including abandoning the fort, Lincoln chose to inform the governor of South Carolina of his intentions to resupply the fort. At 4:30 a.m. on April 12, artillery units from the newly formed army of the Confederate States of America, commanded by General P.G.T. Beauregard, began shelling Fort Sumter, touching off the American Civil War. Lincoln’s political performance as President during the war was stellar. When support for the war began to wane as battlefield casualties mounted, he gradually shifted the focus of the war to the issue of slavery. On April 16, 1862 he signed an act abolishing slavery in the District of Columbia. On January 1, 1863, Lincoln used his war powers to issue an executive order abolishing slavery in the states at war with the Union. The Emancipation Proclamation galvanized and reinvigorated Lincoln’s abolitionist supporters, transforming the war from an effort to preserve the Union to a higher moral cause. Despite continually increasing casualty totals, public unrest elicited by the practice of conscription, and mounting criticism from Copperheads and the Northern press, Lincoln was able to sustain his political base and win reelection in 1864–no small political feat. Lincoln’s body lay in state in the White House for dignitaries on April 18. His funeral was held shortly after noon in the White House on April 19. The next day, the President’s casket lay in state at the Capitol, where an estimated 25,000 visitors paid their last respects. On April 21, a train carrying Lincoln’s coffin, along with the body of his son Tad, who had died during Lincoln’s presidency, began the long trip back to Springfield, Illinois. The train’s route, which passed through hundreds of communities and seven states replicated, in reverse, Lincoln’s trip to Washington as the president-elect. The coffin was removed from the train to lay in state at ten locations during the trip. Abraham Lincoln was buried at Oak Ridge Cemetery, near Springfield, Illinois on May 4, 1865. Since that time, Lincoln’s body has been exhumed and reburied numerous times. Lincoln’s Tomb, in Oak Ridge Cemetery, has been the final resting place for Lincoln since 1901.